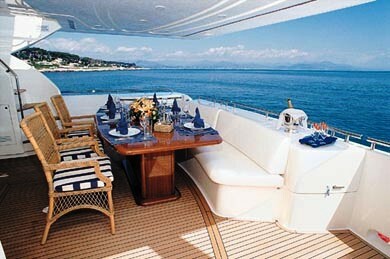 Gwylan a 2002 Ilalian designed Ferrettiin a modern style with fine carpentry, silks and soft leather. 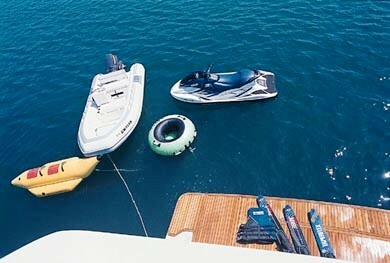 She accommodates up to 8 guests in 2 double and 2 twin cabins with private bathroom facilities and is fully air-conditioned. Price per week: USD 38,000 $ (MYBA Terms). 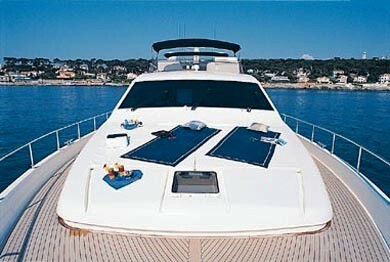 More InfoDesigned and built by Ferretti in 2002, Gwylan offers the very latest in Italian design and styling. Exquisitely finished in cherry wood, the interior gives a feeling of volume, elegance and comfort. 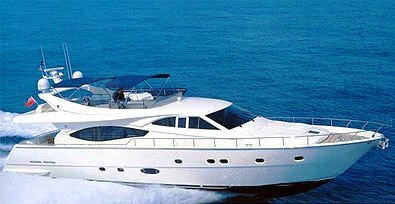 With a cruising speed of 28 knots the possibilities are endless Whether its dining al fresco on the aft deck or cocktails sunbathing on the very generous flybridge, enjoying a sumptuous meal in the dining room or a picnic on the beach, the highly trained crew can provide an experience that will be remembered forever.